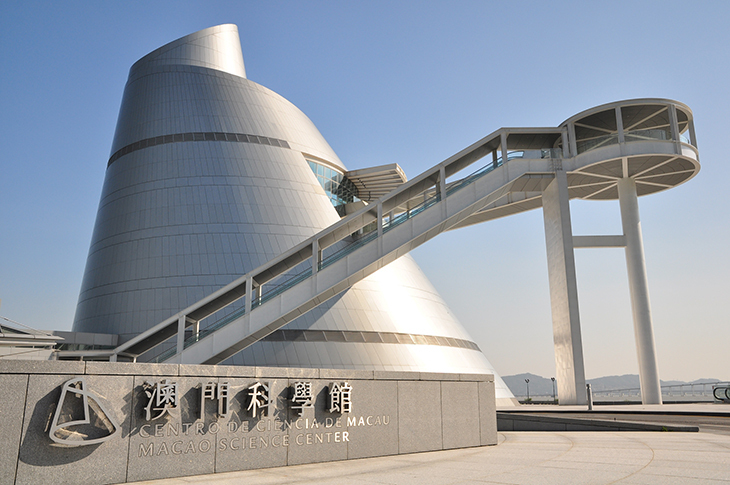 Macao Science Center (MSC) aims to promote science popularization and education among local adolescents, compliment tourism development in Macao and provide a regional platform for science education, convention and exhibition. With a gross floor area of 20,000 square metres, MSC consists of the Exhibition Center, the Planetarium and the Convention Center. The Exhibition Center, in the shape of an inclined cone, is the tallest building that contains 14 galleries arranged in an upward spiral. The dome-shaped Planetarium is flanked by the fan-shaped Convention Center and office building. Supporting facilities include a gift shop, restaurants and a nursery room, providing visitors with a full range of services. The 5,800-square metres Exhibition Center plus its atrium accommodates 12 permanent galleries. The galleries cover topics in Space Science, Fun Science, Children Science, Science Express, Robotics, Acoustics, Physics Mechanics, Genetics, Eco- Conservation, Sport Health, Sport Challenge and Electrics and Electromagnetics Gallery. There are two more galleries reserved for special exhibitions. The exhibitions seek to provide knowledge-oriented, scientific and interesting interactive exhibits, and allow visitors to explore science in a hands-on way. The Center has a mechanical workshop available for educational group bookings. Students who are interested in learning the fundamentals of robotics and robotics design may create their own robotics there. Training will also be provided to subject teachers in order to raise the professional and technical qualifications of both students and teachers. Awarded the highest resolution 3D planetarium by the Guinness World Records, the Planetarium has a dome-shaped tilted screen of 15.24 metres in diameter. It is installed with a set of 12 digital projectors of 4,096 x 2,048 pixels each for showing dome films with ultra high-definition up to 8,000 x 8,000 pixels. The Planetarium having 127 seats and 4 wheelchair spaces are all equipped with interactive controls. Wearing specially made glasses, the audience can see 3D images projected onto the screen. Its powerful database, coupled with an amazing array of projection effects, can take audiences onto a journey travelling freely in space and time. The system can also show digital dome films, making the Planetarium a multi-functional dome theatre. The Convention Center consists of a multi-functional Convention Hall and 4 Meeting Rooms. Two of the Meeting Rooms may be combined into one if needed. The Convention Hall can accommodate 400 people for meetings and about 200 for ballroom events. The Convention Center is equipped with professional audio-visual facilities, simultaneous interpretation system, and video conferencing equipment, making it ideal for different kinds of meetings, lectures, seminars and award presentation ceremonies. Copyright © 2007-2019 Macao Science Center Limited. All rights reserved.